RR Crossing Parking Only Violators Will Be Spiked (Black and Yellow) 8" x 12" Metal Sign, Printed on .040 Aluminum. This is a great Railroad sign. 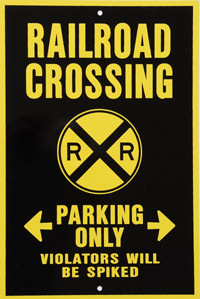 RR Crossing Parking Only Violators Will Be Spiked (Black and Yellow) 8in x 12in Metal Sign is printed on .040 aluminum.